The dream of working for one of the best-loved chefs in the UK is no longer pie-in-the-sky for a group of South West youngsters. The 21 trainee chefs ranging in age from 16 to 24 all come from Cornwall - an economically disadvantaged county with one of the highest unemployment rates. On Wednesday their culinary skills were put to the test (or should that be taste?) at a charity lunch to mark the official opening of Fifteen Cornwall in Watergate Bay near Newquay. The restaurant is the third set up by Jamie Oliver to train and inspire young people from disadvantaged backgrounds to build a career in catering and develop a passion for good food. The long-term aim of television's Naked Chef is to see some of his students open their own restaurants - a vision now shared by Kieran Venner from St Austell. 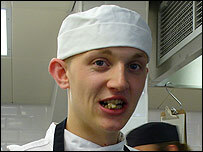 Before being selected for Fifteen Cornwall, the 20-year-old from St Austell said his future prospects were non-existent. Kieran told BBC News that being accepted on the training course was a turning point in his life. "When I was younger I got in trouble with the police and ended up getting sent to a young offenders' institution at the age of 16 and that was a pretty low point in my life. "But I got a job in the bistro cooking food for the staff and that was my first experience of work in a kitchen. "I really don't know what I would've done if I hadn't been accepted, but hopefully the heads of the foundation saw a little bit of potential in me. "The training has been great so far. We've got such a great team and I give a lot of respect to all the staff at Cornwall College because they made it a really good time for all of us. "It's fantastic that the restaurant's in Cornwall because we've got some great produce here and it will be great for the Cornish economy too." None of the trainees have had the best start in life; none have any formal qualifications, some have had drug problems and some have learning difficulties. 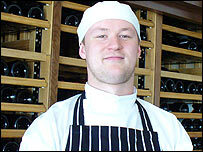 Andrew Harris from St Blazey has had a rather unusual personal battle to keep his place with the other student chefs. The 19-year-old has overcome a seafood phobia and proudly demonstrated this achievement by eating some cockles. "Well, it's a slightly different taste, but I've done it now", he said. "It's been an amazing day. I'm so tired because I was far too excited to sleep last night and I kept trying to imagine what it would be like today." None of the problems have stopped Oliver, who is dyslexic himself, from putting his faith and trust in the ability of these Cornish youngsters. Kieran Venner is determined to do whatever it takes to justify the trust placed in him and build a secure future for his 16-month-old daughter Aimee Jade, who he describes as his motivation. "Two years from now I see myself with some money in the bank and hopefully a nice little two-bedroom house for me and my daughter. "Who knows, maybe nine or ten years down the road I'll be opening my own place and that's something a year ago I couldn't even have dreamed of. "I'd like to do for other people what Fifteen has done for me. Maybe if they're lost like I was, I can help them like the foundation helped me." The sheer tenacity of a Restormel Borough Council employee was one of the reasons for Cornwall being chosen for the second UK training restaurant. Betty Hale, the council's regeneration officer in 2004, has recently retired, but pursued the Fifteen team "relentlessly", bombarding them with emails and telephone calls until they agreed to come and visit the area. Ms Hale was so convinced her county was the perfect venue, she even paid for the flights herself. 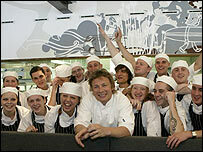 She said Cornwall had the talent, produce and scenery and Jamie Oliver had the necessary clout to overcome the hurdles. One of those hurdles was financial, but the South West Regional Development Agency (SWRDA) and Objective One in Cornwall have provided £1m towards the project's funding. They believe it will have significant and positive benefits not only for the young trainees, but for the county's economy which relies heavily on tourism, agriculture and food. The location of Fifteen Cornwall is almost certain to help keep the restaurant's reservations book full, with its spectacular views of coastline and countryside. Diners will also be able to enjoy the more traditional non-edible delights of Cornwall, with more than two miles of golden sand and rolling waves which attract surfers and extreme sports enthusiasts from near and far all year round. However, one thing which will not be found on the menu at Fifteen Cornwall is a traditional Cornish pasty. Mr Oliver has reluctantly decided it could lead to complaints from local people telling him they had not been made "properly".